This is topic about which Missy and I have very strong feelings. We have come to feel very strongly about the ethics involved in selling unweaned baby parrots. We hope that the needless suffering, stunting, psychological damage, guilt, financial loss, heart break and especially death can be avoided as breeders and pet owners come to understand the reality involved in selling unweaned babies. The two most vulnerable times in a babies life are at hatching and at weaning. 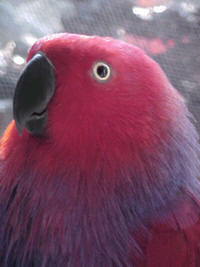 Every day we get calls from inexperienced bird owners with questions about how to hand-feed their new baby parrot. This type of question cannot be answered over the phone is just a few minutes. There is much involved in proper hand feeding and weaning of baby parrots. I see many babies in my avian practice that were fed, housed or weaned incorrectly. The baby birds are the senseless victims in these situations. Many of these new owners have never previously owned a parrot, much less hand-fed baby birds. They usually are not given written instructions or even a hand feeding demonstration. Verbal instructions and reassurance that hand feeding is easy and that nothing will happen may be the only guidance they receive before leaving with their new baby. This situation will almost invariably lead to any number of horrible outcomes. Inexperienced hand-feeders are not able to recognize problems before irreparable damage occurs and death becomes inevitable. Upon examining one of these little birds, you will often find bacterial and yeast infections, crop burns and other problems, but the worst of all to find is a perfectly healthy baby that died of starvation simply because the amount to feed and the number of times a day to feed was information foreign to the hand-feeder. These problems do not stem only from the new owner buy can also originate from a breeder who is ill-informed, has less concern for the babies than for the money, and/or doesn't want to be bothered once the bird is out of their care. This does happen every day! New owners are trapped into buying this adorable little down-covered and by being told by the breeder that they must hand-feed their new baby themselves if they want it to bond with them. This is very misleading. Let's look at it from a practical standpoint. Birds have two types of development. The first to consider is imprinting. Imprinting occurs at the time their eyes open. When the eyes first open, the form that a baby sees will be the form that he will associate as future flocking buddies. When humans are seen first they become the form in which baby birds consider as themselves. To them, we are birds and they are humans. The second type of development to consider is bonding. Bonding is something that occurs gradually and must be fostered. It may not even occur before the bird begins sexual maturity. If bonding were to occur between feeder and baby, babies would bond to their mothers, and we know this does not happen. Bonding with the pet parrot depends on the friendship that develops, not who held the syringe. We have decided that the most preferred and safest method of selling babies is to offer new owners the opportunity to visit their new baby as often as they like while it is in the hand-feeding stages. This gives the owners the chance to cuddle and build a trust with their new baby, and prepare the home environment before taking the baby home. By the time the babies go home they know their name and are comfortable with their new family members. The human and the baby get all of the advantages of building an early relationship with none of the risks that accompany hand feeding and weaning. The visits give us the opportunity to answer questions that may occur between visits, to teach handling techniques, and to counsel new owners on basic pet bird care and behavior. With this method the baby goes home well socialized, well adjusted, in excellent mental and physical condition, and able to sustain itself with an established pattern of healthy eating habits. Hand feeding is easy, but not simple. It is a complex that requires enough experience to recognize problems early. If you are a pet owner who MUST hand-feed, consider waiting until you have bred your own babies. If you will not wait, and have breeder who will support you, make sure that you are SHOWN how to feed, get written instructions, and have the baby examined by an avian veterinarian immediately after purchase, just after weaning, and at any point in between that you feel you may be having problems. MONITOR THE BIRD'S WEIGHT DAILY. Hand feeding is very rewarding to us. I am not condoning that it be attempted by a select few, but it is an art that requires knowledge, skill and intuition. We MUST put the interest of our babies first. Our personal and professional ethics dictate that we will not sell any unweaned babies. We want our babies to be cared for by owners who put the bird's best interest ahead of their own curiosity, need to nurture and quest for entertainment.